For many years speaking my truth just didn’t seem like an option. I was a sensitive child on the inside but quite outgoing and sociable on the outside leaving me an open target to other people’s opinions and views that I often took to heart. On the few occasions I did speak up I always regretted it and somehow felt exposed - if the real me gets rejected I’ve got nothing else left. It was much easier denying my truth, making choices that didn’t matter if it worked or not and keeping shtum about anything that I was genuinely interested in or felt passionate about. Let me tell you now - playing it safe, staying hidden, trying to fit in, meeting other people’s expectations - it all takes a toll on you. I became so withdrawn from who I was, I didn’t even know who I was! I was indecisive, evasive, forgetful, over-emotional, lost and broken all at once. 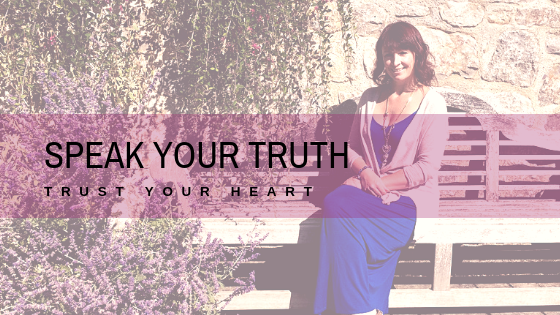 It took some challenging personal circumstances to give me the shake up I needed to start getting really truthful with myself. I eventually came to the conclusion that the pain, dysfunction and general turmoil I perceived in my life was simply an expression of how I felt within and knew I needed to make some changes. I went through what I can only describe as an intensive crash course of self-discovery to connect to the deepest parts of who I was. I started to express my truth through creative outlets, like poetry, music and journalling and felt liberated and alive. The more I opened up and listened, healed, accepted and loved what I discovered about myself the more I became grounded in my own inner-knowing. Other people’s opinions no longer had a hold over me, I learned to live and let live and didn’t feel I had to hide myself away. I had certainty and clarity of who I was within. I was also fascinated by the syncronicity that came into play when I took action on that truth in my life. Things started to fall into place, I seemed to be in the right place at the right time and discovered an ease in my life I’d never experienced before. Start to create an inner dialogue. This could be through writing, talking out loud (maybe record yourself) drawing, painting - anything that supports communication with yourself. It is not the first sign of madness! On the contrary, it’s the beginning of an important relationship with yourself, your true feelings, thoughts and ideas. If something comes up that feels scary, worrying or overwhelming, try to stay with it. Allow yourself to say and feel what you need to and listen with as much love and compassion as you can muster! Use affirmations to attract what you want. For example: “I maintain healthy boundaries in all of my relationships and support and value my own views, opinions and feelings as much as I do anyone else’s.” Or “I find it easy and joyful to communicate how I feel to others, knowing that I am always safe to do so.” Once you start using affirmations in this way, the universe starts to respond and listen, helping you make the necessary transitions in any area of your life. If you’re in a situation that leaves you questioning your own integrity, or is affecting your self-esteem - you might find that affirming your core values will help align you to your truth more easily than sheer determination and willpower can. Believe in yourself and a higher wisdom. Self-belief may sometimes feel like an optical illusion but the trick is to know that at the very core of who you are, is not only beautiful and majestic but is truth, possibility, grace, love and wisdom. You are all of these things and yet it is so easy to judge yourself for not reaching a goal or target therefore investing in a self-fulfilling prophecy that you can’t do it or are not good enough. I want you to create a new self-fulfilling prophecy where your self-belief is at the heart of everything you do and you can use your heart to do it! Trust what you feel and know that you can listen to those feelings and act on them - they come from a place of wisdom. You are part of a bigger picture and a higher wisdom that connects you to everything around you. You have a role to play that is every bit as valuable as the person stood next to you, that is not measurable in a comparative way that society so often dictates - it is only measurable by your heart, feelings and connection. You are unique and your truth is simply an expression of what you know and feel. Your truth is not an opinion - no-one can take it away from you. Your truth is who you are.